Former Attorney General Loretta Lynch finished up a 6-hour closed-door interview with lawmakers Wednesday evening. 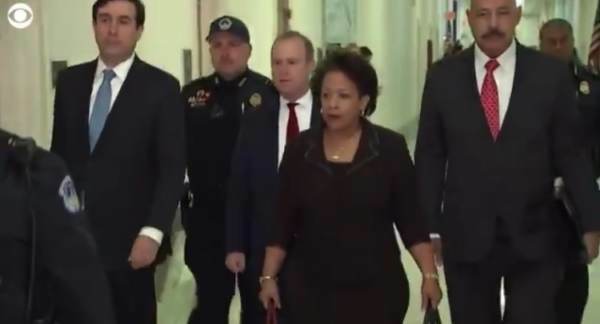 Loretta Lynch arrived on Capitol Hill Wednesday morning as part of a joint investigation with the House Oversight and Government Reform Committees into the handling of the Clinton email investigation and her role in RussiaGate. Lawmakers wanted to ask Loretta Lynch questions about her June 2016 tarmac meeting with Bill Clinton at the Phoenix International airport and Comey’s decision to usurp the DOJ when he gave a presser exonerating Hillary Clinton on July 5th. Lynch, Obama’s corrupt Attorney General, was subpoenaed by the House Judiciary Committee on Thanksgiving along with the equally corrupt former FBI Director James Comey. Comey testified twice to the Committees, including on Monday and refused to answer many questions. According to lawmakers, Loretta Lynch was much more forthcoming about certain topics. Lynch and her lawyers weren’t raising objections to questions like Comey and his lawyers did on many topics. Leaving the interview, Democrats said there was nothing new to learn from Lynch, while Republicans pointed to her differences with Comey in the Clinton investigation and said there were still questions about her meeting with the former President in 2016. Lawmakers said Lynch’s interview was less contentious than Comey, and she and her attorneys weren’t raising objections to questions like Comey did with certain topics. [Republican Congressman] Issa said there were still questions over what happened with her tarmac meeting with Bill Clinton, suggesting that when Lynch met with him in 2016, Clinton could have helped the career of the nation’s top law enforcement officer. Republicans waited too long to subpoena Loretta Lynch and James Comey; House Democrats will take back the gavel in about two weeks. The House Judiciary will not release a transcript of Wednesday’s interview with Loretta Lynch. The panel will release a transcript of today’s interview as a part of its investigation report…alongside transcripts of 16 other interviews..by end of the year.